The Savior met this man, born blind and incurable after every human effort, while leaving the Temple on the Sabbath. Jesus spat into the dirt, made clay, rubbed it in his eyes and told him to wash in the pool of Siloam, a famous water spring in Jerusalem. The Savior did not send him there because his eyes were covered in clay, nor did the pool have healing power, but instead to test his faith and obedience. The blind man proclaimed that Jesus healed him, but this confession caused him to be cast out by the enemies of the truth. Even his own parents would not defend him. However, the blind man followed Jesus from that moment forward. The following night, our Lord Jesus Christ appeared to him in a dream and declared to him the power of the Cross and its significance. When he arose in the morning, he immediately ordered that a labarum be made (which is a banner or standard of victory over the enemy) in the form of a cross, and he inscribed on it the Name of Jesus Christ. On the 28th Of October, he attacked and mightily conquered Maxentius, who drowned in the Tiber River while fleeing. The following day, Constantine entered Rome in triumph and was proclaimed Emperor of the West by the Senate, while Licinius, his brother-in-law, ruled in the East. But out of malice, Licinius later persecuted the Christians. Constantine fought him once and again, and utterly destroyed him in 324, and in this manner he became monarch over the West and the East. Under him and because of him all the persecutions against the Church ceased. Christianity triumphed and idolatry was overthrown. 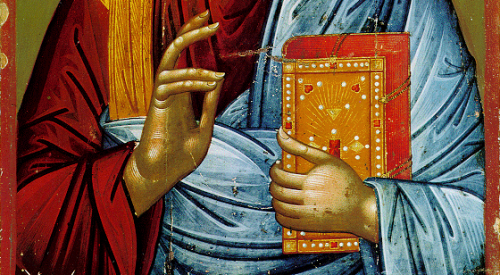 In 325 he gathered the First Ecumenical Council in Nicaea, which he himself personally addressed. In 324, in the ancient city of Byzantium, he laid the foundations of the new capital of his realm, and solemnly inaugurated it on May 11, 330, naming it after himself, Constantinople. Since the throne of the imperial rule was transferred thither from Rome, it was named New Rome, the inhabitants of its domain were called Romans, and it was considered the continuation of the Roman Empire. Falling ill near Nicomedia, he requested to receive divine Baptism, according to Eusebius (The Life of Constantine. Book IV, 61-62), and also according to Socrates and Sozomen; and when he had been deemed worthy of the Holy Mysteries, he reposed in 337, on May 21 or 22, the day of Pentecost, having lived sixty-five years, of which he ruled for thirty-one years. His remains were transferred to Constantinople and were deposed in the Church of the Holy Apostles, which had been built by him (see Homily XXVI on Second Corinthians by Saint John Chrysostom). As for his holy mother Helen, after her son had made the Faith of Christ triumphant throughout the Roman Empire, she undertook a journey to Jerusalem and found the Holy Cross on which our Lord was crucified (see Sept. 13 and 14). After this, Saint Helen, in her zeal to glorify Christ, erected churches in Jerusalem at the sites of the Crucifixion and Resurrection, in Bethlehem at the cave where our Saviour was born, another on the Mount of Olives whence He ascended into Heaven, and many others throughout the Holy Land, Cyprus, and elsewhere. She was proclaimed Augusta, her image was stamped upon golden coins, and two cities were named Helenopolis after her in Bithynia and in Palestine. Having been thus glorified for her piety, she departed to the Lord being about eighty years of age, according to some in the year 330, according to others, in 336. Due to the baptism following Liturgy at 1pm, coffee hour will be very brief with only minimal refreshments. We will celebrate the Ascension of Our Lord and Savior Jesus Christ on Ascension Eve, Wednesday, May 24, 2007 at 6:30pm. This evening marks the final day of Pascha. May 21, 2017 (Sunday) Baptism of Konnie Yankopolus grandsons at 1:00pm. May 24, 2017 (Wednesday) Ascension Liturgy (eve) at 6:30pm. If one loses his cross, his life becomes cold and tepid, without cooperation with God. ‘The pure of heart will see God,’ according to the Lord’s infallible word (Mt. 5:8), according to his capacity, receiving as much as his mind can sustain; yet the infinite and incomprehensible nature of the Godhead remains beyond all understanding. I realized that we all worry about ourselves too much and that only he who leaves everything to the will of God can feel truly joyous, light, and peaceful. Let us avoid overeating and even satisfaction. Only those who have interior prayer and watch over their souls receive the gifts of grace. 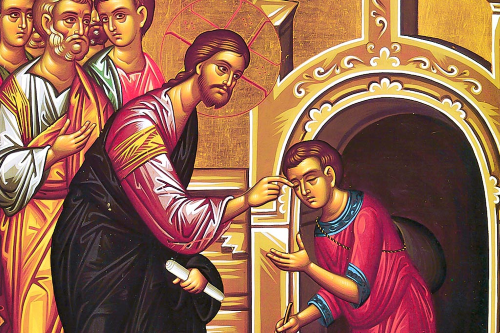 At that time, when Jesus was passing, He saw a man blind from his birth. And His Disciples asked Him, “Rabbi, who sinned, this man or his parents, that he was born blind?” Jesus answered, “It was not that this man sinned, or his parents, but that the works of God might be made manifest in him. I must work the works of Him Who sent me, while it is day; night comes, when no one can work. As long as I am in the world, I am the light of the world.” As He said this, he spat on the ground and made clay of the spittle and anointed the man’s eyes with the clay, saying to him, “Go, wash in the pool of Siloam” [which means Sent]. So he went and washed and came back seeing. They answered him, “You were born in utter sin, and would you teach us?” And they cast him out. Jesus heard that they had cast him out, and having found him He said, “Do you believe in the Son of God?” He answered, “And Who is He, Sir, that I may believe in Him?” Jesus said to him, “You have seen Him, and it is He who speaks to you.” He said, “Lord, I believe”; and he worshiped Him.